Please pay attention to the two pillars of stone of granite. Have make in the granite of Okayama is a design called Ionic. It is with a woman's body imitates, in the upper part of the column there is a spiral of decoration representing the hairstyle. Pillars There is some unevenness When I mentioned in what was polished by the hand of man. Railings of the central staircase is the teak of Nanyang production. Bansuisou is hard teak is used everywhere. Three major precious wood mahogany, walnut, teak, teak Among them is what is difficult sculpture is hard but has been carved everywhere. 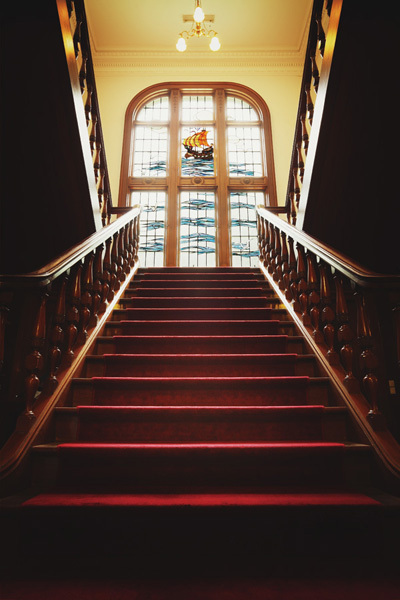 The stained glass of landing the front of the stairs are drawn waves and seagulls, the sailing ship. Earl seems to France and the memories of back and forth as well a number of times Japan have been put. Sailing ship has been placed at the top of the screen, but this is a position that looks floating in front as seen from the second floor of Yingbin room. This stained glass at the time guru, those Kiuchi Shintaro has produced, it has been his masterpiece. Tone of Bansuisou has been unified with white contrast of teak dark brown and plaster. This profound and pomp is what it can be said that the biggest feature of Bansuisou. This hall is named "Room of an audience." The first customers when the Bansuisou was inaugurated in 1922 in November, was the Emperor Showa and become the crown prince after. Crown prince will visit the Matsuyama as commissioner of the Army large exercises, have been 2 nights in Bansuisou. 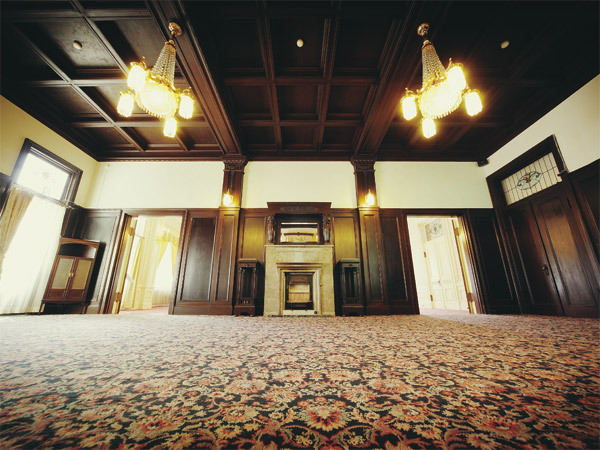 At that time, it was the audience to Hisamatsu Earl in this room. Room of an audience has been unified with gorgeous white. Large mirror is made of Belgium. At the time, Belgium we had the best technology to polish the mirror to the flat. Mirror without any distortion is the shine of the remains of the time. And mantel under a large mirror is marble. This mantle piece had been used the gas rather than firewood. Is a noble French-style features of the Western-style of inlaid gold to white wall has been subjected. The Room of an audience there are two murals. Left of the picture is the "Figure of the Iyo one hundred and fifty thousand stone". In landscape that looked down Matsuyamaheiya from Misakatoge, it has been drawn territory of fruitful Matsuyama clan. Right of the picture is the "Kanagawa Daiba figure". Shogunate was not made on the seventh place of Edo Bay ordered the Daiba equipping the artillery ambush the black ships in the Edo period to the various clan. Matsuyama clan one of them, was responsible for Kanagawa Odaiba. Matsuyama clan was finished in one year with the seventy thousand ryo and a three hundred thousand hits a year worth clan finances. It was flame construction that fill up the sea, but it did put across brilliantly. Earl is became the proud the extent of the power of Matsuyama clan to the crown prince. The two sheets of painting was born painter Matsuyama, drew a Yagi Saika was active in Paris. One of the reasons Bansuisou was elected crown prince of the quarters, the Sadako of Hisamatsu Countess, it was the person who hits the aunt of Nagako of crown prince and your engagement in. 1922 in what kind of talk has been exchanged in this Room of an audience, also it seems that it was one of the topic probably that of Nagako during your engagement. While hidden such a history, this Room of an audience has been communicated to the now those days of brilliance and pomp intact. Here, in a room that was used as a dining room, it has been referred to as the "Cenacle". While the "Room of an audience" was the white of the room, here it is unified in black. A room of gorgeousness, poise and two was used appropriately by being able to stand out. "Room of an audience" the glamorous ceremony, and here "Cenacle" are used, such as in calm dinner party, had become celebrities of social occasion and early Showa from Taisho late. This room, the ceiling has become the coffered ceiling. Only here in the same format as the ceiling of the shrines and temples has adopted the Japanese style. The ceiling, were Yes once powder of the crystal is blown. The is the image of a starry sky. Dazzling chandeliers beneath that, also referred to as a crystal power stand to this under the natural crystal is obtained, but some who are visitors to this power spot in're looking all the way from afar. Bansuisou was requisitioned by U.S. forces in 1945, and was used for 2 years as officer's lodgings. This room was used as a luxury restaurant of French food until December, 1981 from 1954 after that. As the only one of the restaurants in Matsuyama that can offer French cuisine of the time full course, entertainment and has been utilized, such as the sometimes matchmaking. 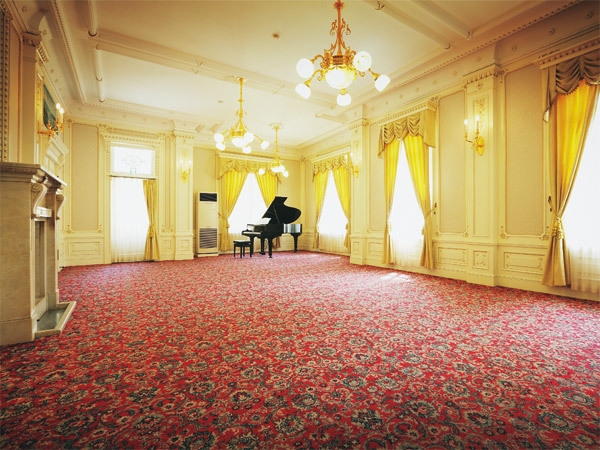 In addition is also performed weddings at that time, this room was also used as a banquet hall. 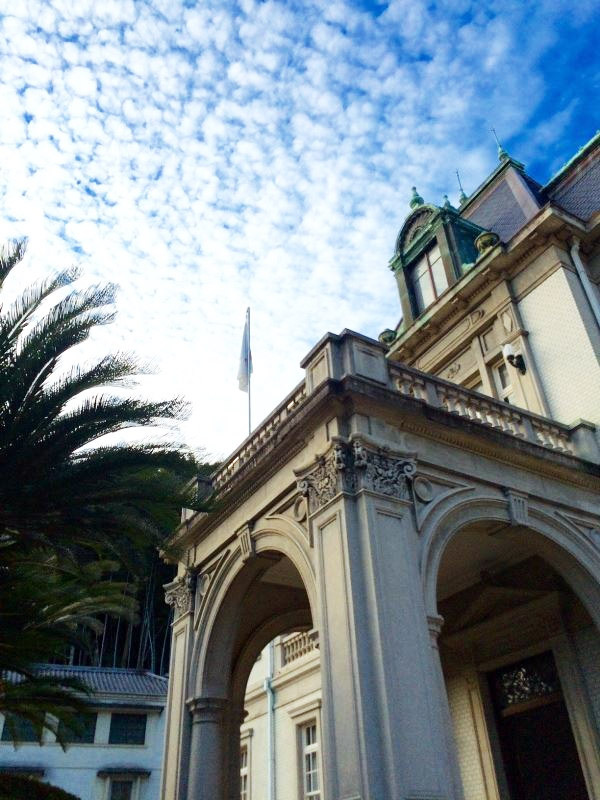 Currently, it is used as a concert and exhibition hall along with the "Room of an audience".